Quick overview A title that relates the life of Teddy Todd - would-be poet, heroic World War II bomber pilot, husband, father, and grandfather - as he navigates the perils and progress of the 20th century. It looks at war - that great fall of Man from grace - and the effect it has, not only on those who live through it, but on the lives of generations to come. WINNER OF THE 2015 COSTA NOVEL AWARD. A God in Ruins relates the life of Teddy Todd - would-be poet, heroic World War II bomber pilot, husband, father, and grandfather - as he navigates the perils and progress of the 20th century. For all Teddy endures in battle, his greatest challenge will be to face living in a future he never expected to have. This gripping, often deliriously funny yet emotionally devastating book looks at war - that great fall of Man from grace - and the effect it has, not only on those who live through it, but on the lives of the subsequent generations. It is also about the infinite magic of fiction. 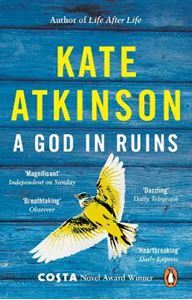 Those who loved the bestselling Life After Life will recognise Teddy as Ursula Todd's adored younger brother - but for those who have not read it, A God in Ruins stands fully on its own. Few will dispute that it proves once again that Kate Atkinson is one of the most exceptional novelists of our age.